The dilution of mass media, shrinking attention span, and decrease in the cost of infrastructure has led to a proliferation of the dynamic digital signage sector. However, the industry encounters critical challenges such as market fragmentation, poor access to quality content, and the ‘bounded vision of utilizing digital signage’ across projects. The lack of standardization in digital signage has shadowed its amenities, making it less preferable than other media channels like the TV and Internet. Moreover, products from different vendors do not mix well, making digital signage systems difficult to expand. These disputing factors suppress the growth prospects of the digital signage landscape. “The failure on the part of end users to plan and budget for ‘content’—a major component of digital signage—is another stumbling block in the industry. Content strategy informs and drives the technology requirements. Hence, it’s more important to the success of the digital signage network than the technology selection,” states Mike Kilian, the Director of Business Development at Mvix. Headquartered in Sterling, VA, Mvix is a pioneer in providing high-definition digital signage systems, among other technologies like videowall appliances, interactive digital kiosk systems, IP-video broadcasting, and content management systems. Recognizing the lack of understanding among end users about the usage of digital signage, the firm employs a consultative, ‘total solution’ approach with its clients. The Solutions Consultants educate end users on building a future-proof signage network and leveraging the versatility of their network in order to maximize their ROI As an initial step, Mvix helps alleviate the hurdles of content strategy by offering custom content design services for template/signage design, implementation assistance services, and managed services. “These services encompass content design and production, playlist, template, and layout set up, content scheduling and monitoring, and operational support,” says Mike. Mvix has leveraged one of its software solutions, SignageCreator, for cross-platform utilization. SignageCreator can be used with other Mvix digital signage systems. Appealing to clients’ specific use cases, Mvix provides guidance on the selection and placement of system components and/or development of custom software and content strategies. Furthermore, the company deploys its Content Management Software (CMS) platforms designed to adapt to a wide range of use cases. “In addition, we also provide dynamic service offerings to complement our clients’ digital signage objectives, such as managed services, installation services, implementation assistance, Signature Support, and custom development services,” says Mike. Mvix invests heavily in creating new solutions for individual market verticals. To illustrate, the company’s BrandSignage platform is a state-of-the-art portal for decentralized digital signage content management across franchise locations. Similarly, the DigitalSchoolMenu portal allows K-12 schools and districts to manage their menu boards, while disseminating nutritional information to students and parents effectively. 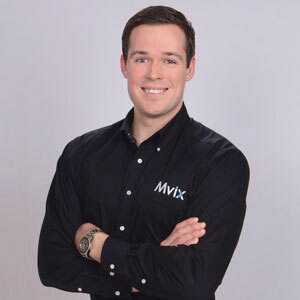 Mike Kilian’s philosophy of resilience, perseverance, and fortitude is ingrained into Mvix’s steadfast approach of building solid solutions at an aggressively competitive price. The firm offers superior products for a fraction of the cost as compared to other full-featured solutions. “The majority of our cloud-based CMS software is free of subscriptions or annual bills, with regular updates at no additional cost. This is one of our key differentiators, which helps us thrive in this fast-growing, rapidly evolving competitive vertical,” asserts Mike. In the years ahead, Mvix envisions developing solutions in the fields of interactive, intelligent, and ‘measurable’ digital signage. Realizing the future of digital signage is linked to solutions involving measurable audience metrics, Mvix will integrate a metric-based system aimed at monitoring audience behavior. They also plan to diversify its solution suite by adding more content-related widgets. “We will continue to enhance our premium content library, which features widgets such as Airline Flight Status, sports scores, Queue Management, and more,” says Mike. Provides solutions for high-definition digital signage systems and few other technologies.